— For the FIRST LOOK at the BATMAN ’66 exhibit, click here. — For The 13 GROOVIEST THINGS at the BATMAN ’66 Museum Exhibit. Click here. The modern wave of 1966 Batmania has seen a gorgeous video release; hundreds of wildly fun collectibles; colorful books; groovy clothes; two entertaining animated features; and a massive outpouring of affection for Adam West upon his death earlier this year. Now, Batman ’66 is a museum exhibit, featuring a Batcave full of costumes, props and other memorabilia. On Jan 10th 2018, The Hollywood Museum will turn Hollywood in Gotham City, as they project the iconic Bat Signal on the side of the historic Max Factor building, at a VIP unveiling gala for “HOLY HOLLYWOOD HISTORY! BATMAN ‘66,” with special appearances by the show’s cast members and other stars in attendance. 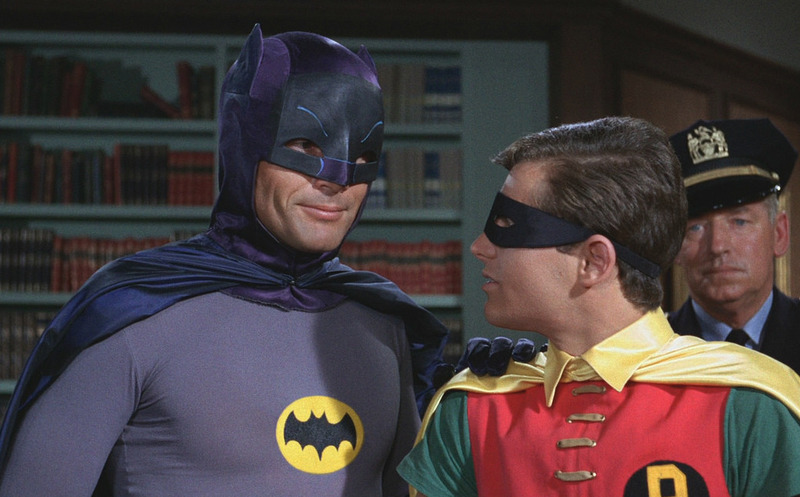 The exhibit, which will consist of four popular sections (Wayne Manor, The Batcave, Gallery of Guest Super Villains, and The Collectibles of Batman ‘66), will pay tribute to the memory of Adam West and honor the other half of the Dynamic Duo, Burt Ward, and the iconic show, still seen today in the U.S. and around the world weekly. Other highlights include original costumes and costumes recreated due to age and condition representing guest star villlians including The Riddler, The Joker, The Penguin, Mr. Freeze – to name a few; , life size sculptures of the three famous women who brought Catwoman to life (Eartha Kitt, Lee Meriwether and the original, Julie Newmar) with costumes, as well as Yvonne Craig (Batgirl), and more, including Adam West’s face and mannequin from 1966. The extensive exhibit will also feature much sought after collectibles, including a the “gotta-have” children’s lunch box, action figures of every shape and size, batman and robin puppets, rare Batman Ice Cream boxes, drinking cups, board games, and many more extremely rare collectibles from 1966 too numerous to name and, in some cases, never before seen on public display. Thousands of hours have gone into mounting this exhibit and a dedicated team of Hollywood Museum staff and world- renown collectors, including Wally Wingert, Scott Sebring, Pat Evans, Tom Woodruff Jr., Nate Truman, Mark Hardeman, Greg Maraio, Alex Zsolt, Christopher Chaisson, Bob Mitsch, Kelly Delcambre, Adrian Van Eck, Ivan Tabac, Brian Puls, Chaz George, Buddy Rogers, Troy Maynus, Daniel Fopma, Dave Tripet, Grigg Espinoza, Rob Klein, and Robert Jungweber have come together to loan amazing items that are now part of TV history – to help create this first ever Batman’66 exhibit, “Holy Hollywood History!” Wally Wingert has been named as the special Curator of this exhibit, with exhibit Organizer, Roger Neal. So, anybody up for a road trip? — INSIDE LOOK at the BATMAN ’66 Epic Villains Display, click here. — Burt Ward and Julie Newmar Discuss the BATMAN ’66 Exhibit. Click here. — NEW DETAILS on the BATMAN ’66 Museum Exhibit. Click here. — JULIE NEWMAR to Attend BATMAN ’66 Museum Gala. Click here. — BATCOPTER Provides Piece of History at BATMAN ’66 Exhibit. Click here. Well, I know I’ll be headed to Hollywood early next year now! This sounds incredible! WOW! Will be in Los Angeles for the 1st time ever in march-april 2018! Hope it will still be around because I AM THERE! To those above planning on going to the exhibit, it closes in April! Hopefully coming to London, UK? The article says that it closes in April! Will it ever be coming to the Tampa Florida area ?